One aspect of paper that is of particular interest to tessellators is its translucency, so finding a translucent paper to test was high on my list. 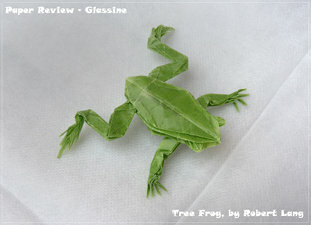 One such paper is Glassine. Glassine is made exclusively from cellulose. It is very thin, smooth, and is both air- and water-resistant. It is translucent unless dyes are added to color it or make it opaque. After pressing and drying, the paper is passed through a stack of alternating steel and fiber-covered rolls (called supercalendering) that flatten the paper fibers. This process produces a firm, yet very thin paper with a glossy effect. Color is added in the pulp stage. The colorless version is food-safe, grease-proof, pH-neutral, as well as chlorine- and acid-free. This is why glassine is often used for food packaging and storing films and documents. Finding a specific brand to use required me to apply some detective skills. I discovered that the paper sold on the Modulor site is probably made and distributed by Folia Paper from Bringmann, Germany. It is a medium sized company with a huge variety of papers for the hobby and craft market. Modulor say that "The folding sheets made from glassine paper are translucent, very hardwearing and are easy to work with. When translucent paper is folded there are always new color nuances and shades appearing because each fold concentrates and darkens the previous color tone. 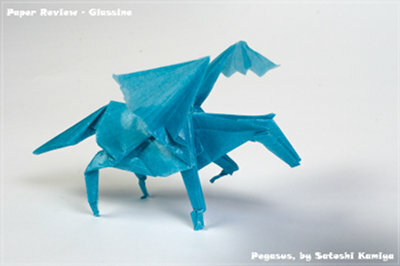 Objects made from folded glassine paper are particularly impressive when hung in a window." Sounds like a good starting point for an origami paper, doesn't it? The colors are basic and uninspiring. Thickness: The measured weight is 40gsm. The thickness measurement is 31 microns, which is by far the thinnest paper we tried (Onion Skin was 46 microns). Sizes: From Folia you get 10cm, 15cm and 20cm squares. From Modulor you get A4 and full sheets of 70cm×100cm. I believe other producers have many other options. Colors: The catalogue lists 11 entries. Four of them are a light version of the usual dominant colors: green, red, blue and yellow. All colors are semi-transparent. The color is soaked into the pulp, so when looking into the light the dense parts in the paper are less transparent and darker. Paper Coloring or Colorability: Although the paper is waterproof, when I used Ecoline water color, the paper curled a lot. Even when it was dried flattened it still had large ripples all over it. The result was not nice at all. Texture: Very smooth to the touch. Photogenic: The colors are a problem, there's not enough variety. But, and it is a big but - the smooth surfaces, the sharp creases and the accurate results make a wonderful sight, and promise great photo opportunities. Aging and Wear and Tear: The numbers in the test machine are 172 and 215 (with and against the grain), which are the smallest numbers we have seen here, but as it's the thinnest paper, it does make sense. The paper is acid-free, which should promise little change in color through the years. 4 out of 10. Memory: Very good, almost perfect. A sharp crease makes the folded flap go completely flat. 9.5 out of 10. Forgiveness: Not good. You should be very careful when you try to reverse a fold line. If you trying to speed things up you may find yourself making a new crease instead of reversing the existing one. Nevertheless, by being careful, you can reverse creases succeessfully. 6 out of 10. Tensile Strength: We refer here to the maximum stress the paper can undergo while being stretched or pulled. With the grain, the paper can hold up to 3.8 kg before tearing; but only 1.4 kg against the grain. Those numbers are much like Kraft paper. 8 out of 10. Bending Resistance: This section rates the amount of force you need to apply to get a sharp crease and how strong the paper is while being curved. This paper has a plastic feeling and it resists being shaped into curved lines. There are no machine numbers since the paper didn't generate enough resistance for the sensors to feel it. 4 out of 10.
or on Amazon.com or Amazon.de (10cm squares, 15cm squares, 20cm squares, 70cm×100cm). or Modulor (10cm and 15cm squares or A4 and 70cm×100cm) directly. Simple models are sharp and clean. For simple folds, this is a highly suitable paper. All creases are sharp, reversing the folds when raising wings asks for determination, but is no big deal here. The white paper is semi-transparent and the result is accurate and clean. We got good results for action models, except for the un-jumping frog. The dog worked just fine, so no problems with a push mechanism. I think this is the most accurate flapping bird I have ever made. The two wings move in perfect coordination. The paper is quite noisy when it flaps! The frog hardly jumps, probably because it's such a thin paper, and I couldn't feel the difference between with and against the grain. 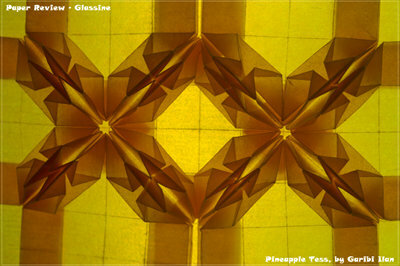 This paper is highly suitable for tessellations with backlighting. Folding the grid took a very long time. Reversing each fold line carefully slowed me down. However, there are benefits to this paper. The crease lines are highly visible, a beautiful image by itself, and so helpful while folding. The collapse was just as slow, but much easier, since the paper is highly responsive and snaps into place perfectly. Moreover, this is the most precise fold I have made and not because of me. Seeing all the creases as whitish lines and being so thin are the two reasons for that. Now raise the paper to the light and you can see the final jewel in the crown - the transparency has a fabulous effect! 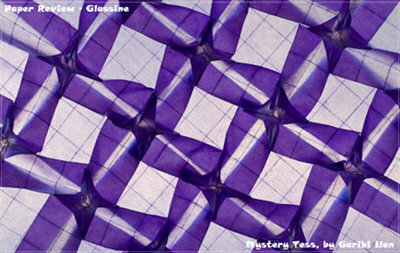 The paper is mostly used for tessellations. The grid was as tedious and as accurate as before! One downside of this paper is the "paper snakes effect" you get when you slide a crease line. In this model the last steps require squashing the paper into little pyramids that caused many tiny snakes like that. The backlit result is very nice, though. It's easy to fold multi-layered models. the main feeling is accurate. You can see the crease lines as if they had been drawn with a white pencil. The transparency allows you to see all layers and whether they fall in the right place or not. Reversing a fold line calls for accuracy when folding the paper in the other direction, since the paper resists it. It's even harder once you reach step 21, since you have to reverse two layers and - even worse - on step 37, the sink. It takes a lot more time than usual to complete. 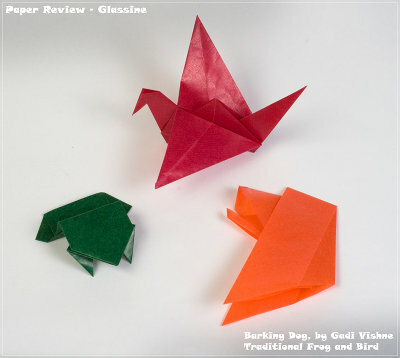 Once you are used to the slow rate of folding, one can enjoy the benefits of this paper. It's easy to be accurate, and creases hold well. Folding all the final details is easy, since the paper is so thin, but it's hard to keep them in place. Corrugating the wings causes no problems at all; the memory of this paper is so strong. The final result is lovely, if not in this unsophisticated color! It's hard to reverse-fold - only one wing is made correctly. Making the grid was slow, and so was folding the base. The paper has such a strong ‘memory' that you need to undo the previous fold with a swipe of your hand before making the next one. It's even more of a struggle when you have to create new fold lines with a squash. Step 36 is just such an example. You need to raise a flap and squash a closed corner, but the paper just won't lie down flat. However, the folding process feels very accurate with this paper; crease lines fall exactly where needed, even with multi-layered folds. It's almost as if the paper has no thickness. I managed to pre-fold the talons precisely as diagrammed, something I rarely manage to do, but it takes a very long time! And then disaster struck. 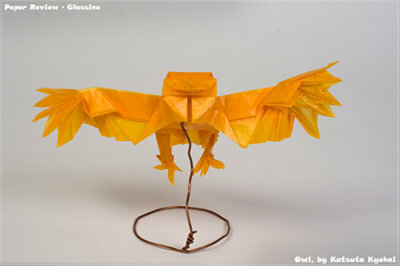 Spreading the wing tips at step 70 means re-collapsing the feathers, but all these reverse folds are almost impossible. I had to reassemble the fold lines one by one, changing the direction of each crease. 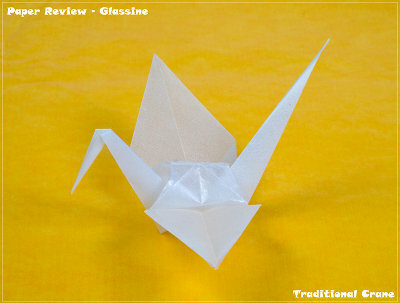 After having folded the first two modules, I realized Glassine is not a suitable paper for this model. The flaps jump out of the pockets and trying to puff the module was difficult. I quickly realized I was not going to finish this model, and abandoned it. Modulars - the perfect candidate for Glassine! After failing with the PowerPuff model, I set my mind to do a classic model with a strong locking mechanism and flat faces. Folding the units was nice. The paper behaves better when smaller in size; it's easier to reverse a fold for some reason. Assembling was much slower. The paper has very little friction, and units tended to fall from my fingers and from the partly assembled model. But all those troubles are but a minor annoyance when you see the final model. I have never seen such an accurate model. All the corners, all faces are perfectly in place. Lovely! The results are unbelievably sharp and accurate. After seeing how graceful modulars became with this paper, I set to fold one more. 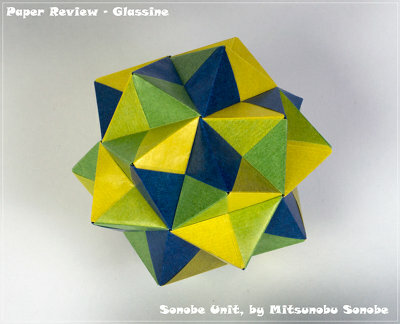 I have nothing more to add from the experience with the Sonobe units. The final model is beautiful. It's hard to shape the small details - look at the eyes. It's better to use other paper for 3D models. 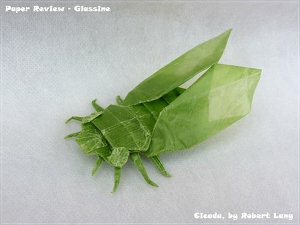 Since the paper is so thin, I tried multi-layered models, such as this cicada. It's very hard to reverse fold lines, as the paper remembers them very strongly. This memory serves you well through the process, but is highly irritating at the final shaping. The paper doesn't forget nor forgive. Every mistake is there to stay! Moreover, a soft spot forms wherever many creases intersect. It's very hard to work with it — have a look at the eyes of this model. Holding this paper in your hand you get the feeling it's too much, well, of everything: too thin; too noisy; too shiny. Start to fold it, and you get more "too"s: too slow; too stubborn; too gentle. Finish your model and suddenly all your complaints are gone - you get an unusually accurate model with sharp, clean, flat surfaces, and visible crease lines. Just splendid. But this is true only for the suitable genres. 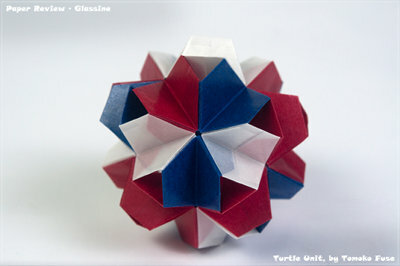 The perfect niche for Glassine is Modular and tessellations. I have never made such accurate models before! Having the translucent effect with tessellations is pure beauty. With the plastic look and feel, this paper is not recommended for 3D models and puffed shapes. For complex, it's only just OK. With the limited color palette and the problem of adding the finishing touches, it may be best used as a good draft paper for the process only. With simple folds, as well as action models, you will be quite satisfied. Searching on Flickr returns 264 photographs, of which only 8 are not tessellations. Some of them exploit the benefits of this paper to the max, and go crazy with the grid, like this wonderful 128 triangular grid piece of art by Ralf Konrad. Bottom line: really only for tessellations and modular models!